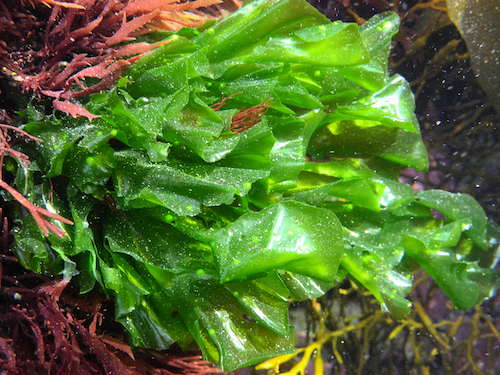 Common names: Sea Lettuce. Glasán (Irish). Description: Thallus sheet-like, emerald green, stiff at the base and more delicate near the growing edges, to 300 long, sometimes with irregular elliptical holes (above). Persists throughout the year. Habitat: on rock and growing as an epipthyte, often developing "green tides"
Distribution: Common and widely distributed. 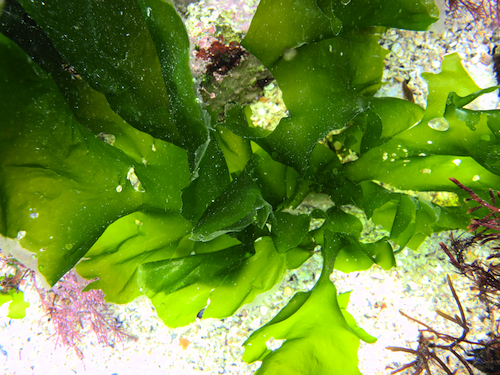 Key characteristics: emerald green colour and stiffness of thallus; however, this and other species of Ulva in the NE Atlantic require expert identification, and even then there is much dispute as to the status of the various species that have been reported including U. lactuca, U. gigantea, U. scandinavica, and U. armoricana. Site © M.D. Guiry 2000 - 2019. Important copyright notice: all text, design and photographs on this site are copyrighted by M.D. Guiry unless otherwise stated and all rights are strictly reserved. Click here for copyright information and contact. Website design: 249 Design Studio. Site maintained by M.D. Guiry (michael.guiry@nuigalway.ie). There have been 8724590 page loads since 1 January 2014 on 22 April 2019.